After a breakdown in marriage, a party seeking a divorce may begin proceedings by bringing an Application for Divorce. To begin, the party bringing the Application will have to prepare an Application for Divorce, along with their marriage certificate, to court for issuing. The court will assign a case number and place a court seal on the Application. The party bringing the divorce must also fill out a Registration of Divorce Proceeding Form which is used to check if the parties have registered for a divorce elsewhere. If the parties have not registered elsewhere, the parties receive a Clearance Certificate and may proceed with the matter. After obtaining a Clearance Certificate, the issued Application must then be served on the spouse and an Affidavit of Service be filled out. The responding party has 30 days to serve and file an Answer (60 days if served outside of Canada). If no Answer is received, the divorce proceeds on an uncontested basis. To obtain a Divorce Order on an uncontested basis, an Affidavit for Divorce must be completed and brought to court along with a draft Divorce Order for a judge to review. After the court issues the Divorce Order, the parties may obtain a Certificate of Divorce by attending the court with a copy of the issued Divorce Order 31 days from the date of the Divorce Order. If both parties wish to obtain a divorce, they can bring a joint Application for Divorce, thereby simplifying an otherwise lengthy procedure. To bring a joint Application for Divorce, both parties must have been separated for a minimum of one year. Separation occurs when the parties live separate and apart without the prospect of reconciliation. 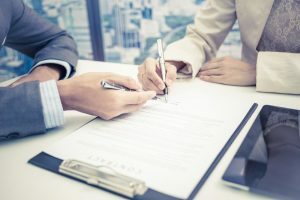 Both parties will be required to file a joint Application for Divorce, an Affidavit for Divorce, a Divorce Order, and a Registration of Divorce Proceeding Form to determine if the parties have been registered for a divorce elsewhere. If the parties are not registered elsewhere they receive a Clearance Certificate and may proceed with the matter. Once a Clearance Certificate is received, the completed forms may be submitted to the court to be reviewed by a judge. If satisfied, a Divorce Order is granted and the parties may obtain a Certificate of Divorce after 31 days from the date of the Divorce Order.